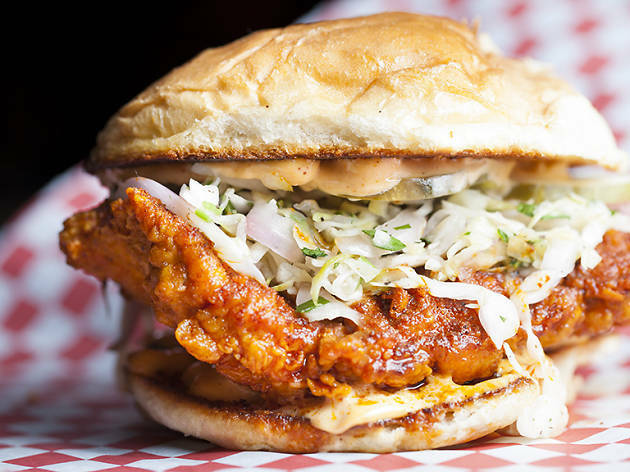 Los Angeles is going through a serious fried chicken craze. 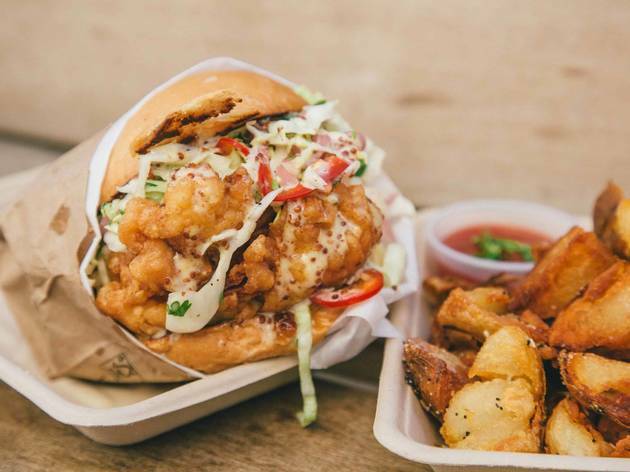 What was once a cheap eats dish found in BBQ joints and diners is now popping up in fine-dining restaurants and food trucks, bringing the gluttony of fried chicken to those who may have otherwise not thought twice about the dish. The best part? It's arriving between buns, too. 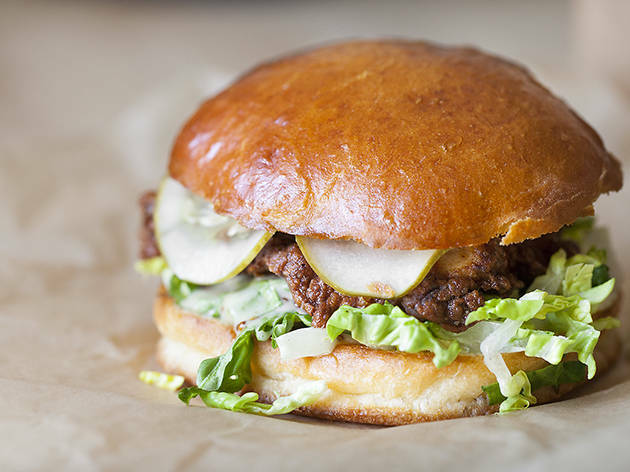 Fried chicken sandwiches are on the up and up, appearing on lunch menus that might also list fois gras, pork belly and steak frites. We did our research (you're welcome, guys) and found nine outstanding options in town—find out which one landed at the top of our list. 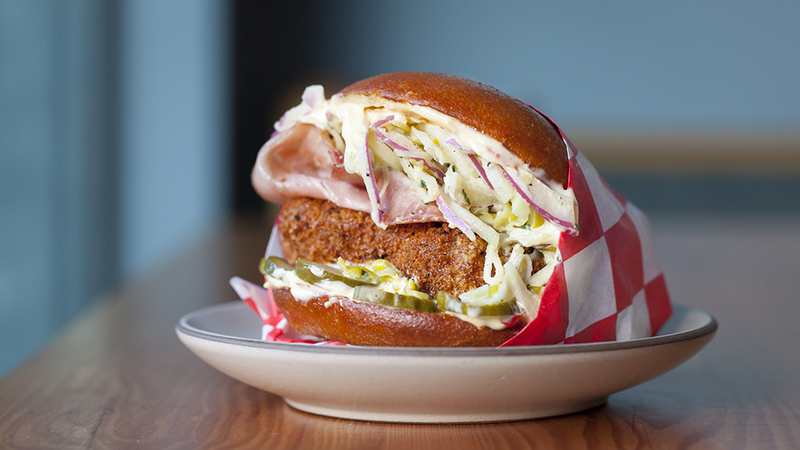 A relative newcomer to LA's fried chicken sandwich scene, Alimento's Chicken Milanese Sandwich ($14) is a decadent, messy thing of beauty, so stuffed with ingredients that you might need to eat it with a knife and fork. 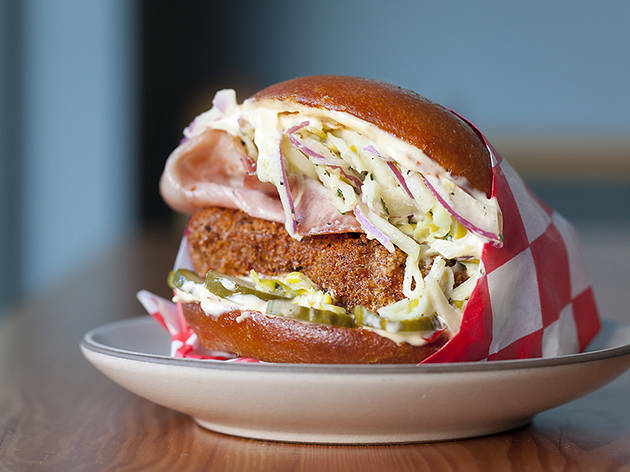 A whole, boned thigh is breaded and fried, then topped with a slice of prosciutto cotto, pickles, peperoncini slaw and spicy chile mayo. We know most people come to this Italian spot for the tortellini in brodo, but you're going to need to switch up your order for your next visit—the sandwich is that good. The Best Damn Chick’n Sandwich Ya Ever Had ($14) at Barrel & Ashes almost lives up to its name (with stiff competition from the other sandwiches on this list, of course). 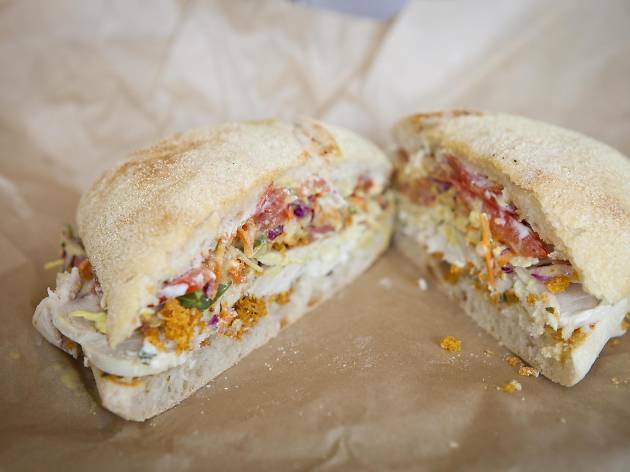 This is a prime picnic sandwich—crispy fried chicken and dry coleslaw, jalapeño and pimento cheese clasped within a poppy seed bun. Pair it with a side of braised greens—sweet, and with chunks of flavorful pork rinds—and you’re set. 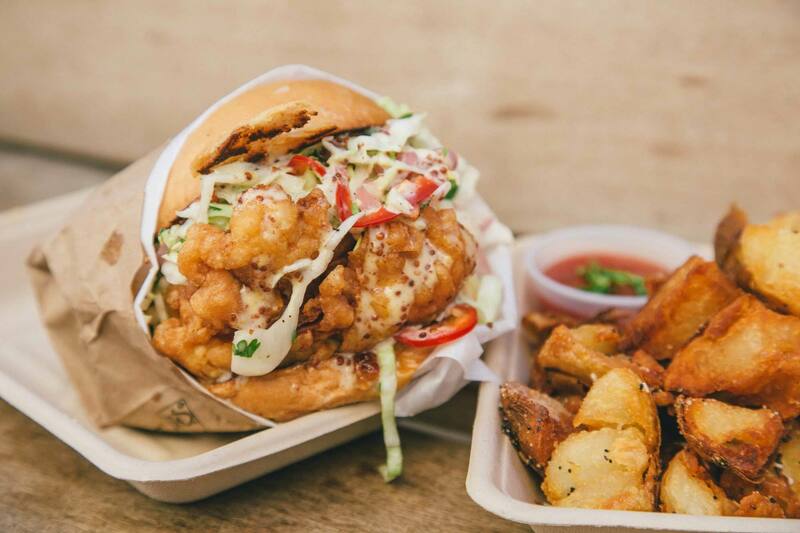 To track down Free Range, you may be wise to check their Instagram first—the roving food truck bounces between Stumptown Coffee Roasters, Coffee Commissary and a few other locations. 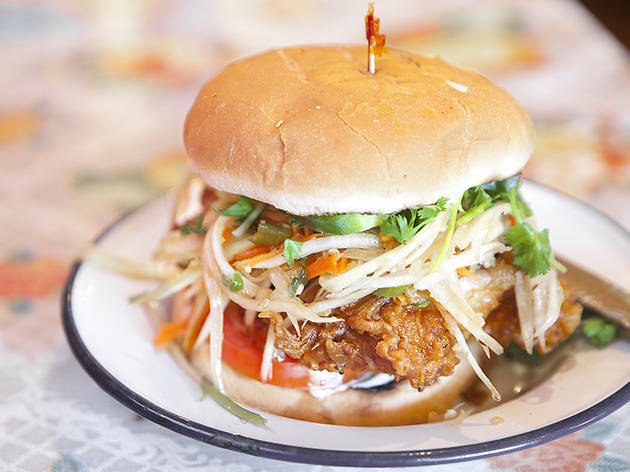 They have all kinds of chicken sandwiches, but their star is the Original Free Range LA Chicken Sandwich ($11), made with tempura fried chicken, fresno chili coleslaw and whole-grain honey mustard sauce on a toasted Portuguese bun. It's a little bit of sweet, a little bit of spicy and a whole lot of delicious. 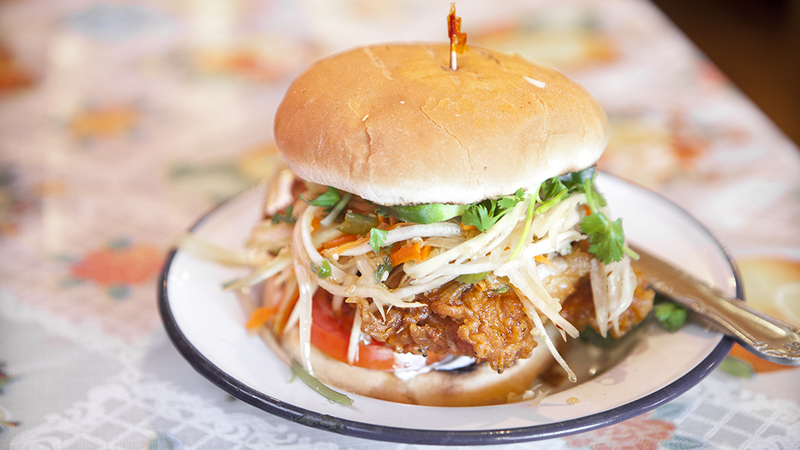 Chef Neal Fraser brings Redbird's casually perfect chicken to a more casual setting at Fritzi Coop. There are down-home favorites—chicken gravy, stewed greens and layer cakes that scream Southern comfort—but none is more quintessentially Fraser than, surprise, the chicken. The Classic triple-breads juicy, 24-hour-brined chicken and fries it to a golden crisp, then completes it with a thick smear of pimento cheese and some cool lettuce, pickles and tomato. We do declare. 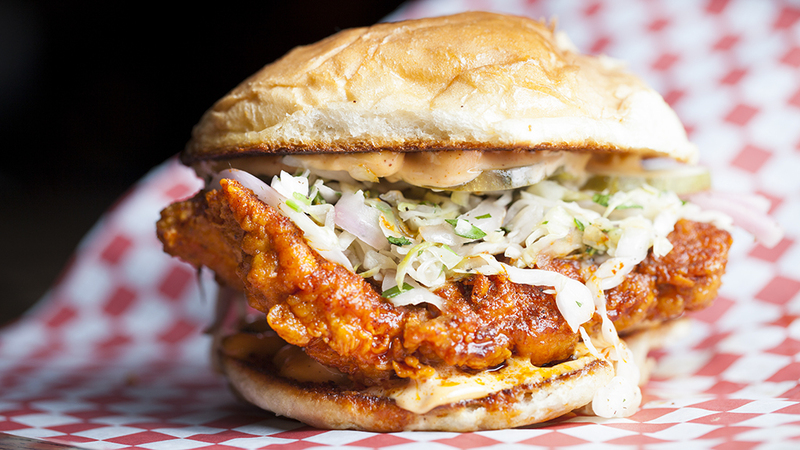 Howlin' Ray's wildly addictive chicken sandwich ($11) doesn’t hold any punches on flavor—or heat, for that matter. 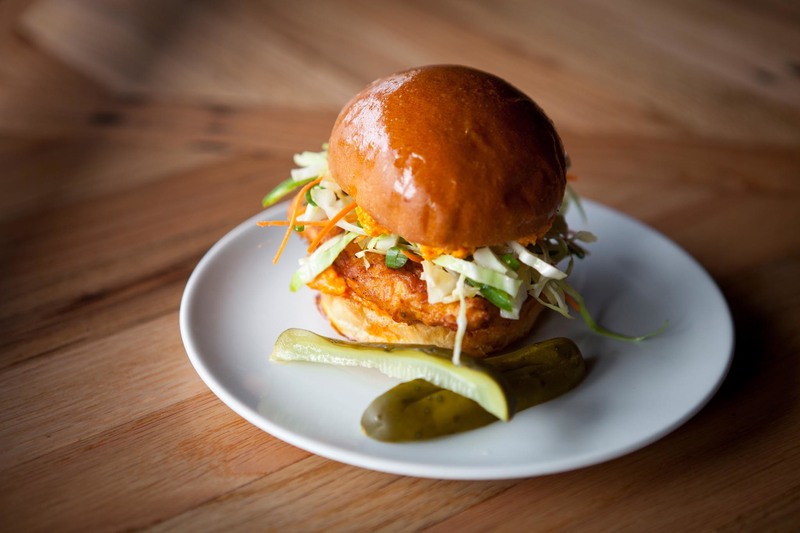 While you can choose between ordering the sandwich "hot" or "not," we can’t see why anyone would want to forgo the face-tingling euphoria of Nashville hot chicken. 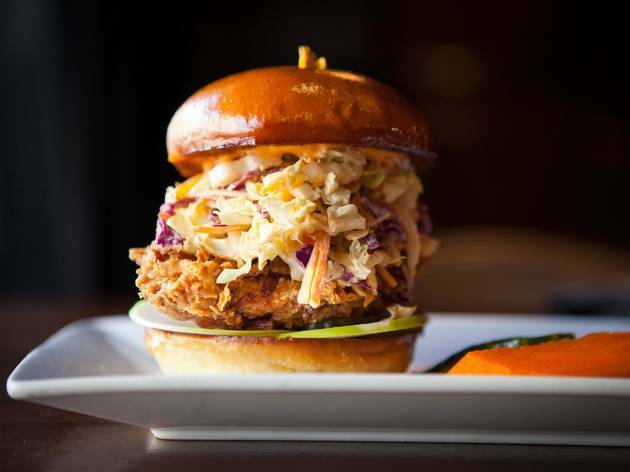 The butter bun, cabbage slaw, pickles and Southern spread help balance out the heat to keep each bite as delicious as the last. You’re going to want to order those hot shake fries ($3), too. If you take a date, just be sure they order their own, because neither of you are going to want to share. 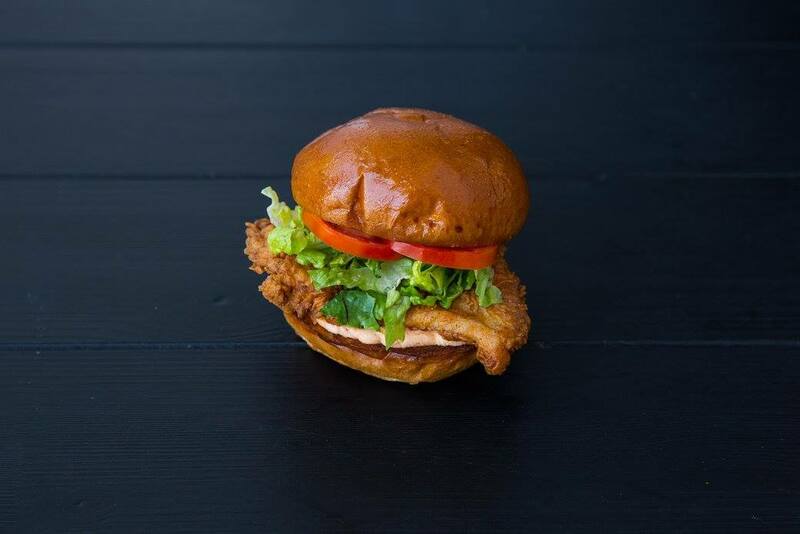 Okay, so Mendocino Farms' "Not So Fried" Chicken ($9.65) might not technically be fried, but hear us out: the shaved, roasted chicken is rolled in Mendo's krispies, giving this dish the mouthfeel of fried chicken with a healthier spin. 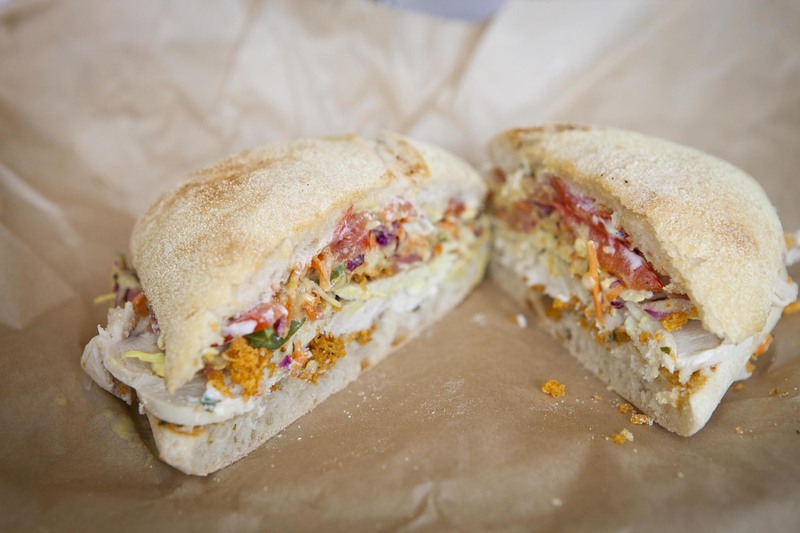 Herb aioli, tomatoes, mustard-pickle slaw and pickled red onions are piled between toasted ciabatta, and you can opt for a side of either chipotle BBQ sauce or mustard pickle remoulade. Bonus: you won't feel like there's a rock sitting in your stomach after you eat. Sometimes the Misfit's Crispy Chicken Sandwich ($15) makes it onto the $5 rotating Barfly lunch menu (the restaurant's discounted menu available from noon-4pm on weekdays); when it does, it's a call for some serious celebration. But even when it doesn't, the extra $10 you'll have to shell out is totally worth it. 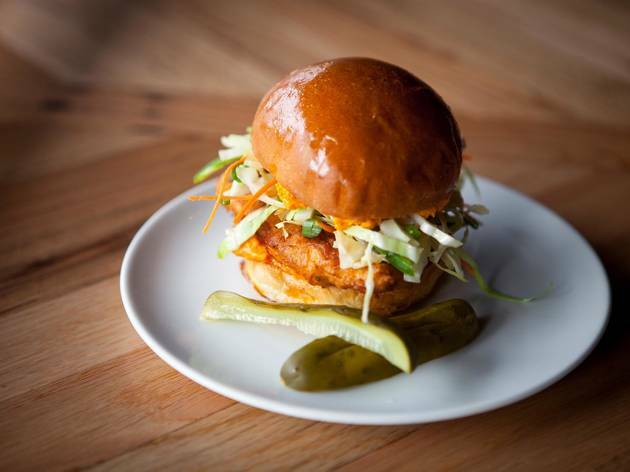 A crispy jidori chicken breast is offset by the crunch of fennel-apple slaw and a slathering of spicy mayo, while a beautifully buttered bun holds the whole thing together. You'll never want to let go. Other than Animal Style Fries, this semi-off menu sandwich ($9) may be one of LA’s most beloved secret menu items. Despite being available for both lunch and dinner, the sandwich is intentionally left off the evening menu; you’ll have to make a point to ask for it. It's worth it, though: a crispy chicken thigh is accompanied by papaya slaw, ranch dressing, cilantro and the sweet heat of jalapeños, which all pairs perfectly with a crisp Singha beer ($6) to make for a delicious meal you'll want to tell everyone about—secret menu be damned. 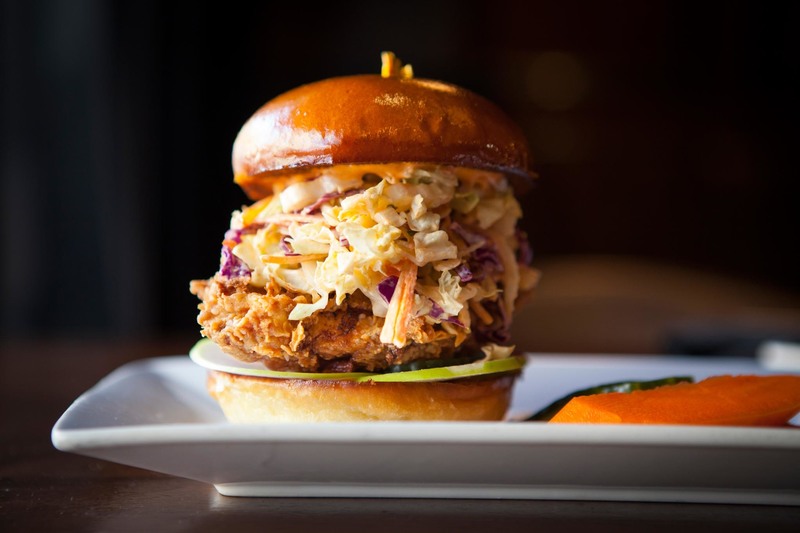 Osso's Fried Chicken Sandwich ($12) is only available at lunch (Tue-Fri 11:30am-2:30pm) and it thrives on simplicity. 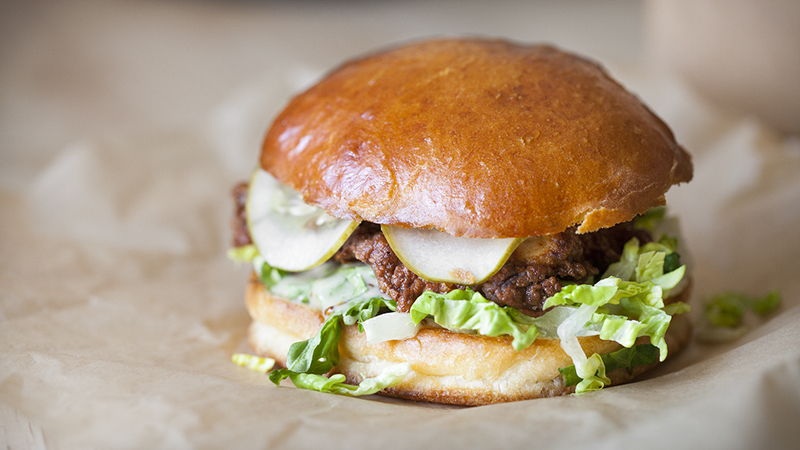 Honey mustard, lettuce and pickles are the only ingredients that supplement the star of the sandwich, but it's enough. The chicken—thick, battered and fried until it reaches a dark caramel hue—is incredibly juicy on the inside and maintains a satisfying crunch on the outside. You'll be so won over by each bite that you'll almost forget about the 20% service fee Osso tacks onto each check.